We are here for you. The daunting (at least it can feel that way) pool design and build process doesn’t have to feel that way. Our experts at Desert Springs Landscaping will help you through each step and make it as easy as possible. Imagine what you want the final product to look and feel like. 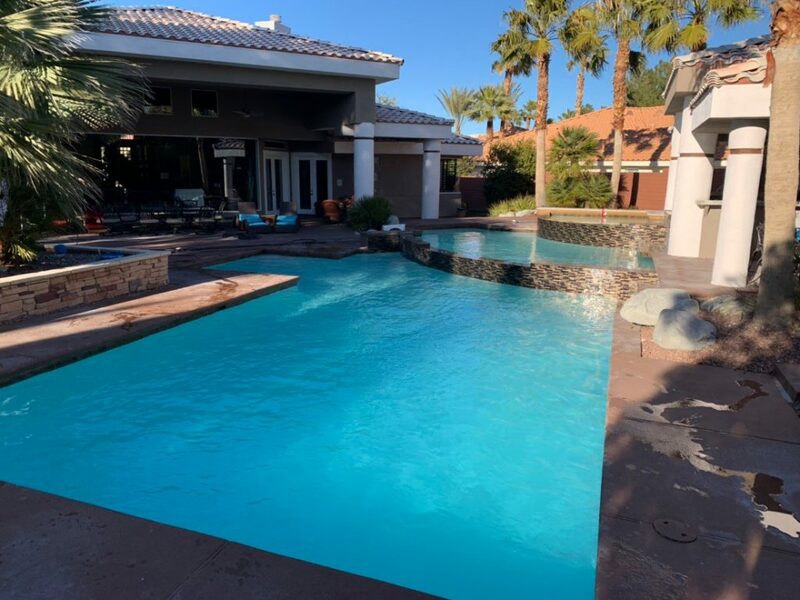 Our special 3d rendering process will bring your Las Vegas and Southern Nevada backyard and swimming pool project to life and our beautiful showroom allows you to touch and feel different tiles and pool bottom finishes (the plastering process). Plastering a swimming pool sounds pretty complicated but when you know what you are doing (our experts have decades of experience) it is simple and we guarantee our processes. There are many different finishes to choose from and the final selection will to give your pool exquisite look. Several different finishes are available to give your pool plaster the best and most unique look possible. Also, here are Desert Springs we have our own team of plastering experts so we won’t be outsourcing to another company for your project. 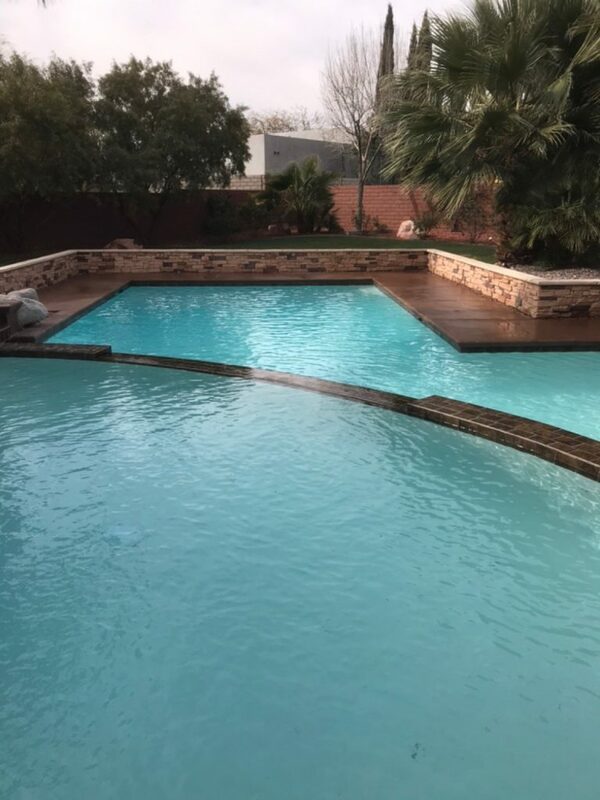 We are with you every step of the way from consulting to design to the first shovel in the dirt to construction to the first splash with your family and friends. And, boy, will it feel good, or should we say, perfect. 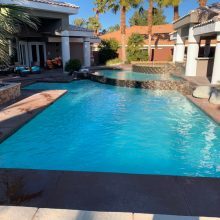 Desert Springs is your Las Vegas swimming pools experts and love to work with customers all over the Southern Nevada valley including Henderson, North Las Vegas, Summerlin, Green Valley, Anthem, Southern Highlands, Summerlin and everywhere else. 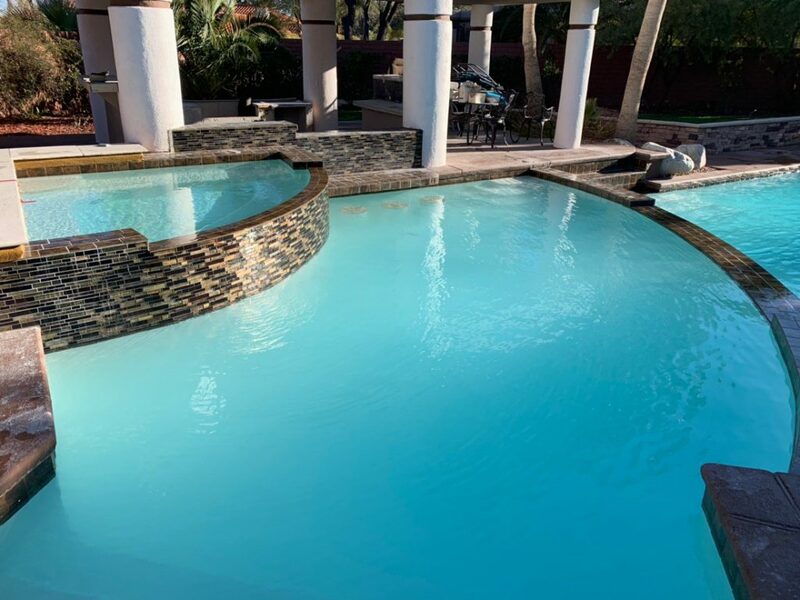 One of the most popular pool plaster finishes in 2019 is adding colored ceramic-coated sand to the mix. This can create great blues to vibrant reds and other varying colors and hues. The finished look is stunning to say the least. A different option is to create a luxurious look with a blending of crushed quartz with color tints. 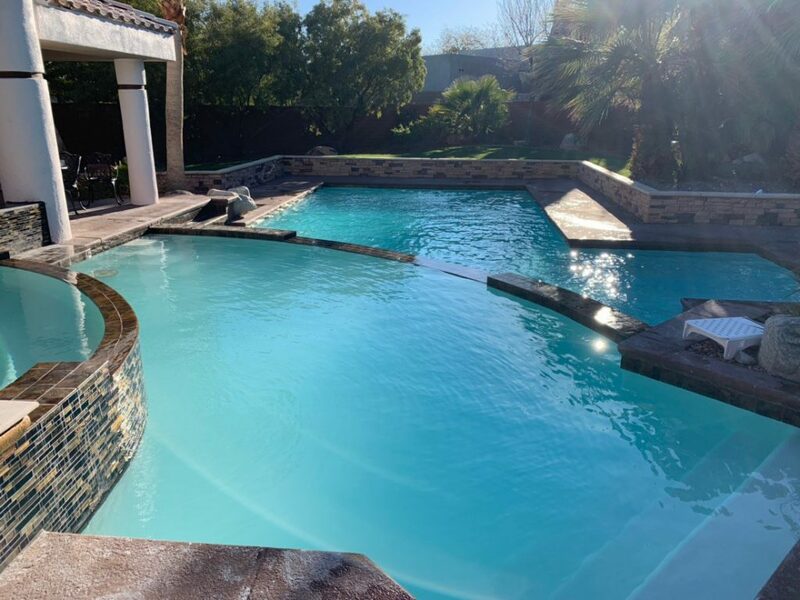 When re-plastering during a pool remodel, a premium blend of crushed quartz, white cement and color tints is a nice option. The quartz creates an extremely unique look and is durable for a long time to come. Nowadays, what are called aggregates are very popular. The aggregate offers the look of a pebble-type bottom and exudes a lagoon-like bottom finish. These pebble surfaces are now offered in a wide array of colors and combinations. This is arguably our most popular selection among our satisfied customers. The pebble finishes also have the benefit of durability and are low maintenance in addition to being slip proof. Everyone will love how deep, luxurious and welcoming the water looks with a pebble finish. You can visit our store room and meet with our design experts while viewing different finishes on our complete and operational swimming pools that are on property. We also have a deep inventory of tiles and more to show you. Call 702-436-8080 to set an appointment. 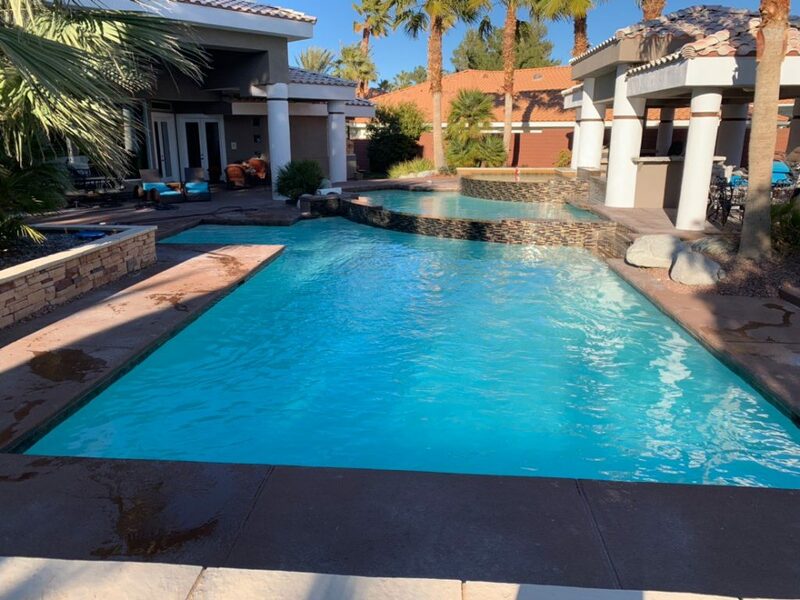 We hope to see you soon and we look forward to helping you create your best Las Vegas swimming pool masterpiece or renovate your existing pool. Thanks for reading—Rob, owner.